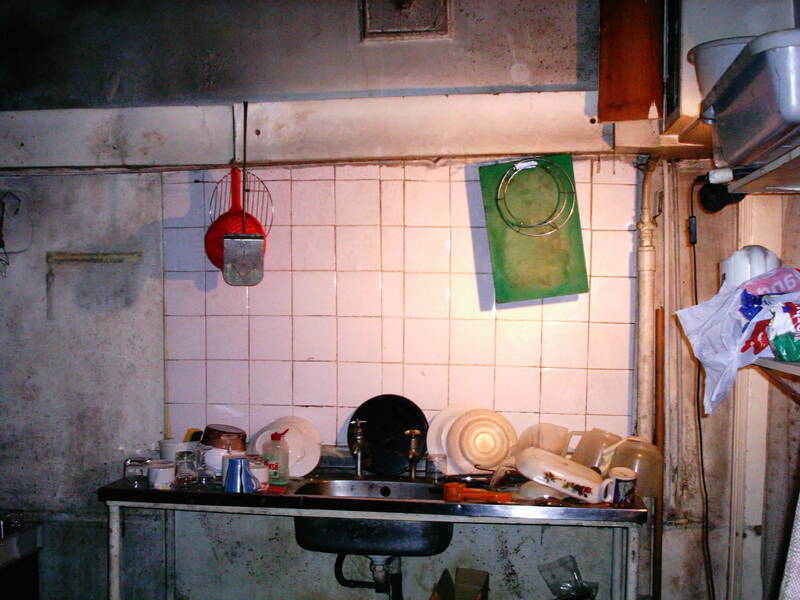 In 2004 the Kitchen / Control Room area looked like this. The double drainer sink unit took up far too much space and the gas main into the meter just came up through the floor. Unfortunately it was too costly to move it to a more convenient place, so it had to stay and get boxed in. We did get the meter moved from above the door to the side next to the pipe so that it could all be boxed in together. This all made the doorway a bit narrower, but there wasn’t a lot we could do about that. 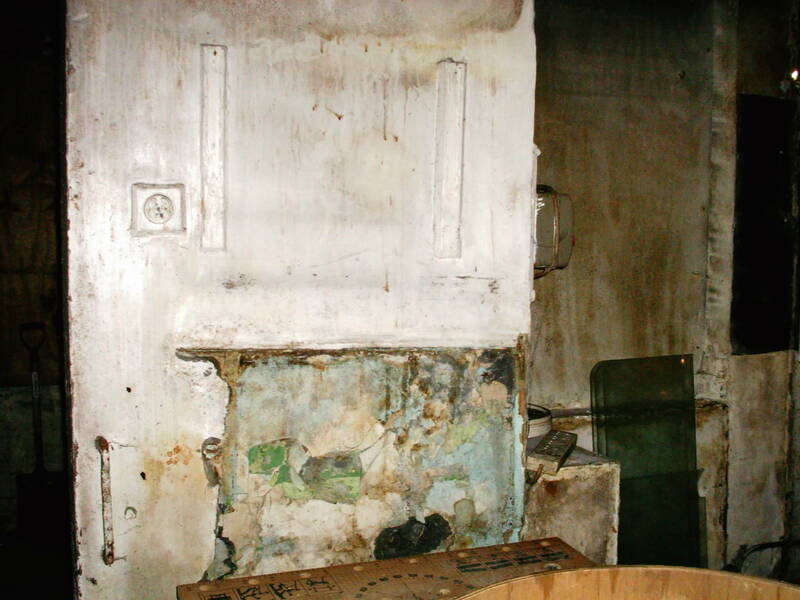 The small square panel right at the top/centre of the picture is an old flue, and is all that remains of the original ovens installed against this wall when the premises first became a bakery back in around 1915. 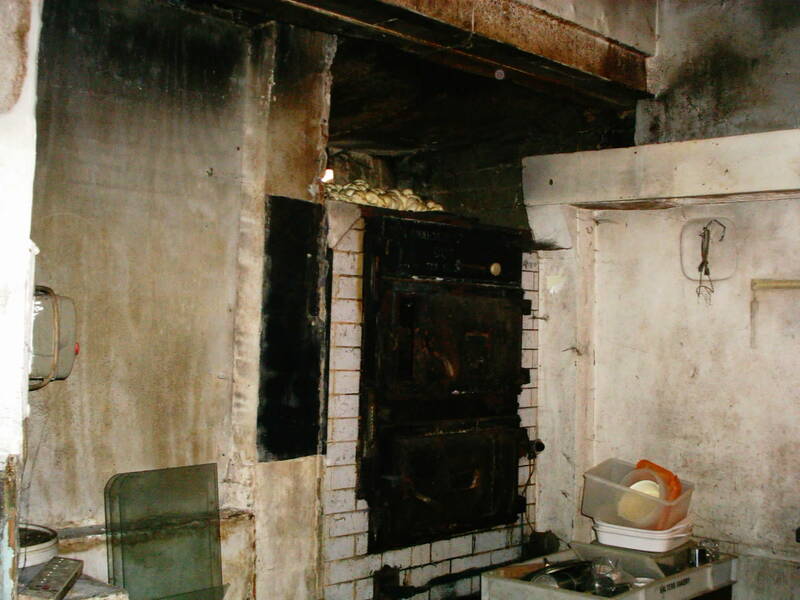 Here is the picture you saw earlier of the state the ovens were in in 2004. In this picture you can also see the rusty RSJ holding up the opening where the brick-built ovens are built onto the rear of the premises. Above the ovens is a sheet of asbestos that rainwater poured onto for several years since some kids kicked their football through the roof. Occasionally on a Sunday morning we would find a cat up there taking advantage of the heat held from the week’s baking. These ovens used to be fired up 6 nights a week, 50 weeks a year bringing in a gas bill of over £1000 a quarter. On the left of the picture was a window that we had to brick up after a burglar broke in and smashed the frame to pieces. The original lean-to roof also once had skylights. We had long-since had them removed as they leaked. The glass that you see leaning up against the wall were the shelves from the shop window. I kept them until 2011 in the hope that we could use them for something else, but alas, they didn’t fit anywhere. Against this wall, where you can see a patch of different coloured paint, was where our main dough mixer was bolted in. It was also a very old machine that once ran on a steam engine. The large belt that would have originally been attached to the steam driven pulley, was later attached to a large electric motor that was bolted to the floor. If you come into the studio, you’ll still see the concrete on the floor where the holes were filled in. The motor ran off a 3-phase supply that you can see up on the wall to the right. Some health & safety shields had been attached over the years, but weren’t sufficient for todays standards. The only reason we were allowed to keep using it was because the baker owned the business and he was the only person who used it. Our staff were never allowed to use it. Together with the ovens we did offer to donate this to a museum. Two guys came up from a museum in Essex in a transit van to collect it, not realising just how heavy it was (over a ton of solid cast iron). After spending several hours trying to get it out of the building they were forced to give up and we eventually had to give it to the local scrap metal dealer who had to break it up with a sledghammer in order to remove it from the premises.